This kettle is mostly made of glass—German Schott glass to be exact. It weighs 4.2 pounds and measures 8 x 9.6. x 13 inches. It has an ergonomic handle with a lid release button. As a safety feature, its lid softly opens, slowly releasing steam in the process. This also eliminates the possibility of splashing. In addition, it has a safety auto shut-off and boil dry protection. All of its parts are free of BPA as well. Breville is a manufacturer of small kitchen appliances, primarily based in Sydney, Australia. The company has been operating since 1932 and became a household name upon the successful launch of the original sandwich toaster in 1974. When the toaster was introduced to New Zealand and Great Britain, it received the same level of success that Breville became the generic term associated with the toaster. Today, the company has created other devices, including the automatic teapots and tea kettles. What is great about Breville’s products is that they can be used to brew loose tea leaves—oolong, white, black, green, herbal, and custom. They also come with four strength settings—strong, medium, mild, and custom, resulting to the perfect brew. 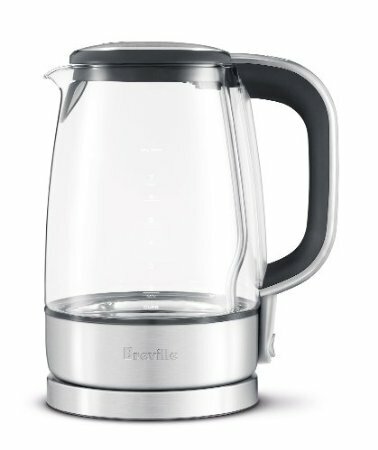 So, if you prefer to brew loose leaves rather than tea bags, take a pick from these Breville Teapots & Tea Kettles. While these products have their share of disadvantages, they are undeniably the ideal choice for making a cup of perfectly brewed tea. Moreover, they are made from a manufacturer that you can trust—Breville. Whether you are looking to buy an electric kettle or a teapot, whether you want to compare various brands or even when you want to see which model from one specific manufacturer is the best, the TheTeaSupply.com reviews will get you to the most viable conclusions. Check out all the tea product reviews from the TheTeaSupply.com!